Fantastic news for all of the UConn “cycle-paths” out there (and for those trying to reduce their carbon footprints)! Tomorrow (October 14th) marks the start of a new bicycle sharing program for undergraduates and graduate students. “Cycle Share,” created and administered by the UConn Recreation Facility, will allow members of the student body to rent bike packages (i.e. bike, bike lock, and helmet) for themselves at no-cost. Long-Term Cycle Share Reservation: Ideal for those with a consistent thirst for exploration and a crazy schedule, this option is a semester-long rental that begins now and ends the Wednesday before Thanksgiving break. Students interested have until Friday, October 23rd to register in person at the UConn Adventure Center, located in Student Union Room 228 across from the Information Desk. Act fast, as rentals are on a first-come, first-serve basis. 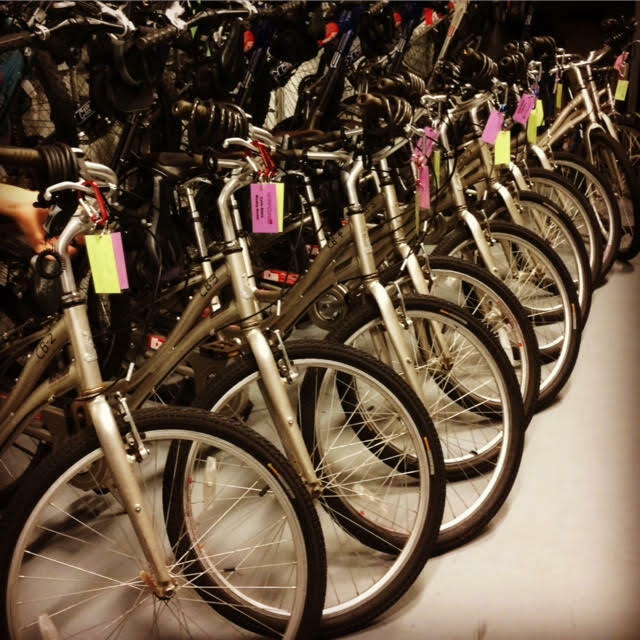 Thursday Cycle Share Reservation: Aren’t sure you’ll need a bike for the entire semester? Try out this week-long rental option. Pick-up your bike on Thursday morning and have it back the following Wednesday by 5pm. 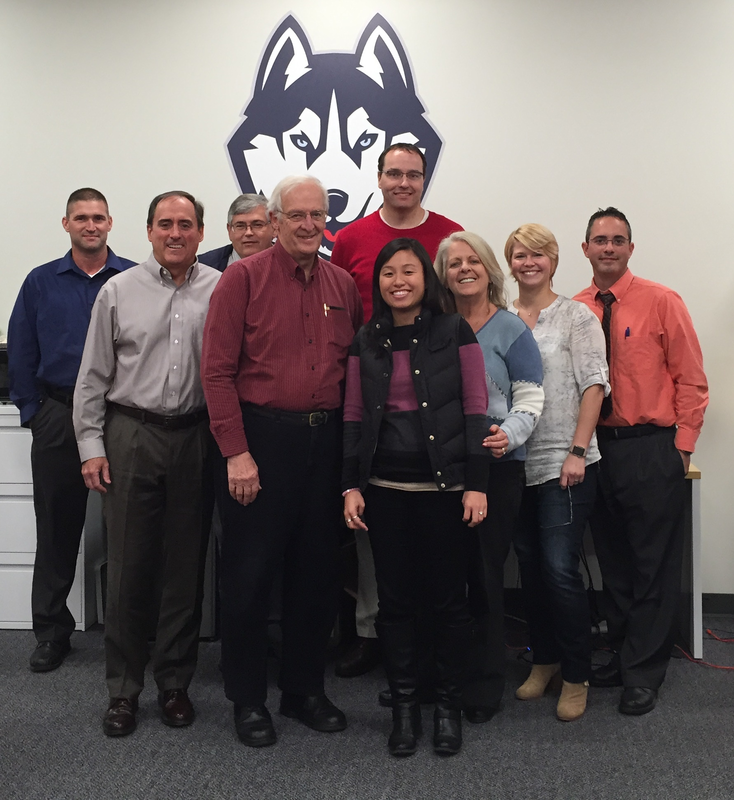 Registration opens up the week prior to each rental period on UConn’s RecRegistration website. For both sharing programs, bicycle pick-up and drop-off is conveniently located at the UConn Adventure Center in the Student Union. Can’t wait to cycle? Visit the RecRegistration website or head to the Adventure Center today! A row of Cycle Share bikes at the UConn Adventure Center waiting to be taken for a spin. This past Monday, October 5th, marked the beginning of EcoMadness. For those of you who don’t know, EcoMadness is a month long competition amongst residence halls to promote water and energy conservation. This year, Buckley, East, Northwest, Shippee, Towers, and West will participate for the chance to win a Dairy Bar ice cream party. Each building is equipped with a meter to measure the gallons of water and kilowatt-hours of energy consumed per student each day. Residence halls will be ranked based on percent reduction and overall per capita use. Students are encouraged to cut back on water and energy use through methods such as taking shorter shows, reporting leaks to “Stop the Drop,” turning off lights when no one is in the room, and unplugging appliances and electronics when not in use. Those students who are especially motivated are encouraged to step up as EcoCaptains, who educate and encourage their fellow residents to conserve water and energy. If you are interested in becoming a leader, contact Ben Breslau at benjamin.breslau@uconn.edu. Activity ideas for promoting conservation among residents can be found on the OEP’s website. EcoMadness continues until November 1st, when the final dorm standings will be calculated. Weekly progress updates will be sent out to let residents know how they are doing in terms of water and energy usage. Good luck to all of the participants! 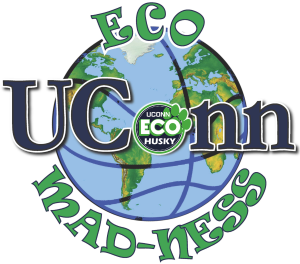 Last Saturday, September 26th, the collective efforts of the Office of Environmental Policy and students from EcoHusky, EcoHouse, and the Honors Program generated yet another successful Green Game Day. 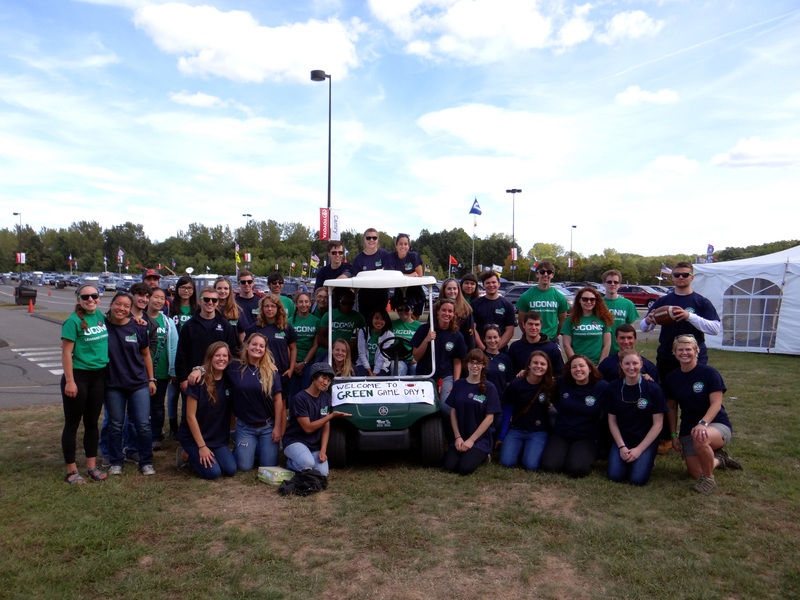 As the UConn Huskies faced off against Navy, our volunteers strived to collect as many recyclables as possible, educated tailgaters about recycling, and discussed with them the various sustainability initiatives at UConn. As stated by one of our volunteers, Caroline Anastasia, “The people who allowed us to educate them were very grateful.” The outcome of the football game may not have been desirable; however, the 1,520 pounds of recyclables collected, and the wealth of knowledge spread, can certainly be considered a victory. Pictured below are teams of volunteers collecting recyclables, and members of the OEP educating fans about sustainability and recycling. We would like to thank all of the volunteers for their hard work, as well as the students, alumni, and families for being so receptive and appreciative of our goals.